Hunting backpacks give big-game hunters the ability to cover greater distances and keep all their belongings and gear handily accessible. These backpacks are designed to carry items specific to hunting and they are capable of handling huge loads of meat after a kill. We can measure a good hunting backpack both by what it can store on the way out and how much additional weight it can handle on the way home. If you’re hunting big game, you need a hunting backpack if you plan on bringing back the spoils of your labor. Our list of the Top Ten Hunting Backpacks includes options for hunters that target specific game, as well as a few great all-around choices. 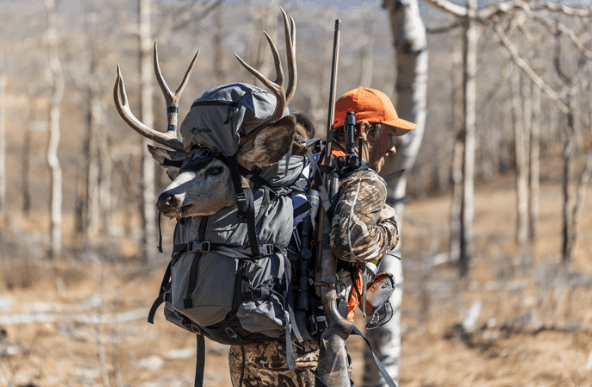 Furthermore, be sure to read through our Buyer’s Guide to learn the most important criteria for choosing the right hunting backpack for your needs. The ALPS OutdoorZ Commander is an external frame hunting backpack that’s designed to stand up to the rigors of year-round hunting expeditions. It is made of durable nylon ripstop fabric that resists tears and rips in even the harshest environments. This pack is best for individuals with a torso measurement (1) between 17 and 23 inches. This hunting backpack allows you to organize your gear among five distinct pockets. It boasts a dedicated spotting scope pocket, a large main compartment, front pocket, and two side accessory pockets for smaller items. It also features a clip-style holster, drop-down rifle pocket, and hydration pocket and port. The Eberlestock Mainframe hunting backpack is designed for experienced hunters that like to customize the layout and organization of their hunting gear and supplies. The Intex II frame truly allows for endless configurations and the frame can be used independently when you’re carrying out your game. When carrying gear, this backpack supports the addition of various options via zippers, buckles, or MOLLE/PALS webbing (2). It boasts three built-in compression straps and an adjustable ladder harness to make carrying comfortable with large loads. The exterior material of this hunting backpack features 1000-denier waterproof nylon construction. The Badlands 2200 hunting backpack is a truly versatile, stealthy, and comfortable pack that’s fully loaded with features that’ll make you more successful on your next hunt. The pack is made of DWR-treated fabric that resists moisture, dirt, and blood. The fabric also offers scent suppression, which will make the drive home much more enjoyable. 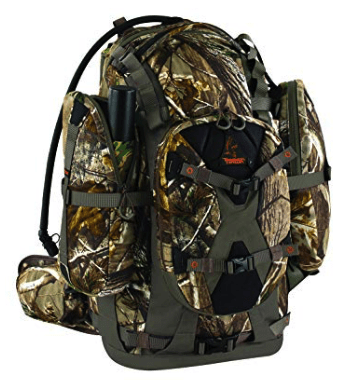 This hunting pack boasts ThermoMold suspension with molded foam that matches the contour of your shoulders and back. The T-6 Aircraft Aluminum internal frame with load lifter straps moves the pack’s weight from your back to your hips in order to reduce fatigue. In addition, the 2200 features whisper-quiet KXO-32 fabric (3) that makes you virtually undetectable to your prey. Timber Hawk’s team delivers one of the best hunting backpacks for serious hunters that often enjoy multi-day backcountry trips. The pack offers a total capacity of 56.2 liters and can carry a rifle, bow, or tripod in multiple ways, allowing you to customize your load for comfort and optimum accessibility. The Timber Hawk Killshot hunting backpack is made with durable, ultra-quiet twill lining and comes with a pull-out rain cover. It also boasts a two-liter reversible hydration bladder and bottom and top lashing points for external storage. Additionally, this hunting backpack features an adjustable shoulder strap system that fits multiple torso sizes and a deluxe padded waist belt with ergonomic tightening adjustment. The Shift hunting backpack from INSIGHTS Hunting is optimal for hunters that want to carry either a rifle or a crossbow (or both!) effortlessly. It gives you the ability to seamlessly switch from a rife to a crossbow with little effort. It’s also the only pack of its kind that offers a unique optics protector that doubles as a removable gear compartment. This hunting backpack boasts an improved optics shield design and anchoring system. It also comes with a new TS3 gear access system (4) and Realtree EDGE coloring. This pack’s designers have combined weapon carrying capability with superior gear organization for multi-talented hunters. It’ll even handle your needs during muzzleloader season. The ALPS OutdoorZ Pursuit hunting backpack is made for hunters that want to move light and fast through thick, wooded country. This pack is also a great choice for hunters in places that experience inclement weather, as it comes with a blaze orange rain cover that keeps your gear dry and safe when the weather turns. This hunting backpack boasts a unique organizational front shelf pocket that gives you the freedom to keep your essential gear at your fingertips at all times. It also comes with a drop-down rifle or bow holder pocket, quiver holders, and a hydration pocket and port. Furthermore, this pack features a total capacity of 2700 cubic inches and accommodates clip-style holsters via two pockets with reinforced webbing. The Badlands Superday is a hunting backpack made for maximizing day hunts. It provides ample space for all the gear you’ll need for a day in the field and includes a number of useful features that serve to eliminate distractions and keep you focused on your game. This pack is capable of carrying a rifle, bow, and pistol. It is a hydration compatible hunting backpack that snugly fits a two-liter water bladder. It also boasts an ergonomically advanced molded foam suspension system that matches the contour of your body. The pack’s load lifters also serve to transfer heavier loads from your back to your hips to reduce fatigue. Finally, this pack features KXO-32 fabric, which is the strongest, quietest, most waterproof material in the hunting world. The Slumberjack Carbine 2500 is ideally suited to hunters that spend most of their time on all-day excursions or minimalist overnight trips. The pack is made of 600-denier polyester and boasts a supportive single-stay suspension system that assists with even the heaviest loads. This pack’s multiweapon carry system allows you to transport a bow and/or rifle. This hunting backpack includes a built-in rifle rest that helps you stabilize your shot. It also comes with multiple pockets that make it easy to keep your gear organized. The front pockets are best for smaller items while the two large side pockets are ideal for optics, a bipod, and other bigger items. In addition, this hunting backpack features multi-use compression straps that keep your load secure and also double as a trophy carry system. If your priorities are comfort and durability, the ALPS OutdoorZ Dark Timber shouldn’t be overlooked. This hunting backpack features a padded waist belt and shoulder straps designed to provide superior comfortable even when the pack is fully loaded. An adjustable sternum strap also helps you secure the pack comfortably to your body for daylong hunting trips. This hunting backpack comes with a large main pocket where extra clothing and larger gear can be organized while remaining accessible. It also comes with side mesh pockets, a lower storage pocket, and a hydration pocket port. Once loaded down, this pack’s side compression straps help to pull the weight in closer to your body’s center of gravity, making it much easier and more comfortable to carry. The Horn Hunter Forky Day hunting backpack is made for small-game hunters that like to travel light. At the same time, however, hunters will like that you won’t have to sacrifice storage space in order to minimize carrying weight. It even includes bottom gear loops that add to its total storage capacity. This hunting backpack has a large main compartment, six medium compartments, and two side pockets. All of your items, big and small, can be organized efficiently and effectively with this hunting backpack. 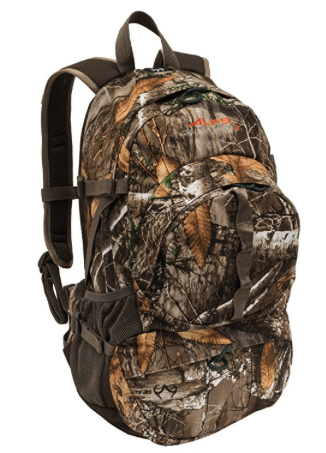 Finally, this pack’s molded foam padded back makes carrying it for day hunts comfortable. The packs we’ve highlighted above are designed for various applications. The best hunting backpack for you depends largely on how you intend to use it, what specific game you wish to hunt, where you predominantly hunt, and a host of other factors. Even though we’ve already narrowed down your options, it’s important for you to find the exact pack that’s right for you so that you can move onto actually use it. This Buyer’s Guide will focus on the most important characteristics that set hunting backpacks apart from one another. There are a lot of design elements that backpack designers include to capture your attention and, ultimately, convince you to purchase that pack. When it comes to actual use, however, there is one main design element that matters before all others. That element is whether the pack can be classified as an internal or external frame pack. External frame hunting backpacks are ideal if you plan on carrying meat in the backpack after a kill. They give you added support for the sometimes-awkward shape and size or your kill and are better at supporting heavier loads. Another benefit of external frame packs is that they allow for additional airflow between your pack and your back, which serves to keep you cooler as you lug your day’s earnings back home. The main disadvantage of external frame backpacks is that they can be a little less stable, overall, when compared to internal frame packs. Internal frame backpacks aren’t designed to carry the large loads that external frames can support, but they are more comfortable and allow the user to move lighter and faster. Depending on the type of hunting you’re doing, this can be a considerable advantage. Backpacks with internal frames are actually designed to mold to your specific body type, which makes them much more stable. This design can also serve to reduce fatigue. Once you’ve decided on an internal or external frame, you also want to make sure the pack you choose offers plenty of space for gear storage and organization. If you like to customize your pack’s storage system, look for a pack that boasts MOLLE or PALS compatibility. Dividers also make it easy to keep clothing organized on overnight hunting trips and external pockets should be large enough to safely store the items you’ll need the most access to while hunting. In addition to the pack’s frame, there are a couple of features that help you manage the pack’s load. If you plan on carrying your game home comfortably, look for packs that boast load lifter and compression straps. Load lifter straps are typically located at the top of the pack’s shoulder straps. They serve to lift the load above your hips so that it is supported by the strongest bones and muscles in your body. Compression straps help to move the pack’s weight closer to your body’s center of gravity. When combined, these two features for load management help to make your pack more comfortable and can significantly reduce overall fatigue on multi-day hunting trips. When we talk about the size of a hunting backpack, we have to break things down into two categories. The first category is the amount of gear the pack can carry. Most packs that are designed for day trips or hunts where you’ll only be out for a few hours offer a capacity somewhere around 3,000 cubic inches. For these types of hunts, this is plenty of space for your personal gear, hunting supplies, extra ammo, scopes, small tools, and maybe even a trail camera. Packs that are designed for multi-day hunting trips, on the other hand, typically offer a total storage capacity somewhere in the range of 4,500 to 7,000 cubic inches. These packs will help you cover more terrain and keep you prepared for anything you might encounter during multiple days in the wilderness. While these larger packs take some time to get used to carrying (if you haven’t before), the trade-off is that they truly give you the space to bring along everything you’ll need, along with a few “comfort” items. The second category to consider when we talk about size pertains to how the pack fits with your unique body type. Comfort should not be overlooked when choosing a new hunting backpack, especially if you plan on carrying a lot of ground. Pack’s that are either too long or too short for your specific torso length can cause painful backaches and discomfort in your hips. Torso length is the major measurement you’ll need to help you find a pack that is the right size for your body. Be particularly wary of packs that claim to be “one-size-fits-all.” If you encounter this, be sure to read through user reviews to see how people with varying body sizes like the pack. You could even contact the manufacturer directly to get more information about the pack’s exact fit. We are talking about hunting after all. If your pack is noisy and cumbersome, it’s probably not going to lend to a successful outing. Look carefully at the materials used in the backpack’s construction to know if the manufacturer has taken steps to make it quieter. Ideally, your pack’s material should stay quiet when snagged on bushes or branches. In addition, the zippers and buckles should operate quietly so that you don’t spook your prey when trying to set up your shot. Just like with fancy design elements, it can be easy to get distracted by the sheer quantity of features that some packs offer these days. Deciding which features are truly essential for the applications you intend is an important part of choosing the right hunting backpack. For our money, the top two features your hunting backpack should include are a rain cover and water bladders. Keeping your gear dry in the event of rain or snow is almost as important as staying hydrated throughout the duration of your hunt. The best part of buying a pack with an included water bladder is that it gives you the means of staying hydrated without constantly having to remove a water bottle. Water bladders also allow you to noiselessly rehydrate without scaring away your prey. Most hunters are aware that animals hunted in the wild offer better sources of meat than what we might find in the supermarket because they consume a natural diet and roam free, as they were intended to do (5). Once you’ve decided on a hunting backpack, it’s important that you know how to use and maintain it so that it lasts for years. This Frequently Asked Questions section will address some of the most common concerns about caring for and maintaining hunting backpacks. What’s the best way to clean my hunting backpack? Start by emptying your backpack of all its contents that aren’t “washable.” This basically means anything that didn’t come with the backpack when you bought it. Go into your bathroom and fill your tub with hot water. Dump in the same type and amount of detergent you’d normally use to wash your clothes when you get back from a hunt. Any scent-free, non-UV soap or detergent will suffice. Now add your pack, and all its components, to the tub and let them soak for two to three hours. Remove and hang dry before refilling and heading out for your next trip. Do you have any tips for removing blood from my pack’s fabric? Fresh blood can usually be removed from fabric with a simple, but effective application of a heavy-duty soap (like Oxi-Clean) and cold water (6). However, the blood that can get on your pack as the result of a kill will likely have plenty of time to dry before you get a chance to wash it out. In this case, there are several options for removing it. Hydrogen peroxide is effective at removing blood from fabric and is actually recommended by some hunting backpack manufacturers (7). Other inventive ways to removed blood from fabrics include the use of meat tenderizer, an enzymatic cleaner, lemon juice and sunlight, and an assortment of stronger treatments (8). Should I spray my hunting backpack with some type of waterproofing substance? There are a variety of waterproofing sprays that can help to provide an additional layer of protection to keep your gear and supplies dry in inclement weather. While having a good pack rain cover is going to be your best bet to keep water out, you can also look into a spray and seam sealer if you’re really concerned. One of the best waterproof sprays is Scotchgard Outdoor Water Shield. One bottle will typically be enough to cover your entire backpack. Some additional methods for keeping your hunting gear dry are through the use of a waterproof liner, dry bags, or heavy-duty plastic bags and containers. What are the top 3 items I should always have in my hunting backpack? This is highly debatable. Indeed, it would be much easier if you asked about the Top 40 items to keep in your hunting backpack. When it comes to gear and supplies, there’s a lot of credence to the “it’s better to have it and not need it” mentality. With that said, if we had to narrow it down to the top three items to have in your hunting backpack, we would go with paracord, a multi-tool, and a lighter or flint and steel. Preparation can’t be underestimated when taking extended forays into the wilderness to hunt game, whether your preferred prey is elk and deer or grouse and pheasant. The hunting backpacks in this article give you a place to store all of your gear in an organized fashion and some offer the extra space you’ll need to bring even the largest of kills home. We hope you’ve enjoyed this list of the top ten hunting backpacks and we wish you the best of luck on your next hunting trip!